It’s taken a while, but Nintendo’s famous turtle-stomping plumber is finally getting his due. Although Lara Croft already beat Mario to the punch in this regard, the iconic video game character is finding a way to one-up her by having the inaugural road of a new suburb in Spain named in his honor as opposed to re-naming an existing road. 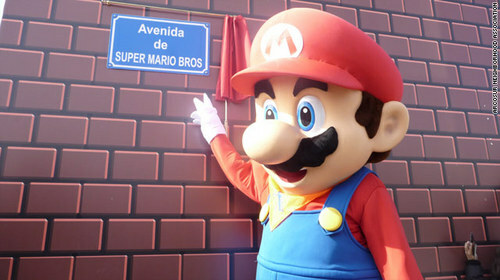 Avenida de Super Mario Bros was just christened in Zaragoza in Northern Spain this past weekend, marking the first in a series of streets named after famous video game franchises and characters. Expected to follow after Mario are roads named after Sonic the Hedgehog, Space Invaders and The Legend of Zelda, to name a few. Arcosur, the housing zone inside the Zaragoza suburb (confusing, no? ), is a project aimed at first time home buyers. The video game themed names came from an online poll where the future residents could pick the names of their streets. Besides having awesome road names, Arcosur residents hope that the media attention this is garnering will push the Spanish government to finish the project by June of 2012, its current projected completion date. This isn’t really a huge story news wise, but I thought it was a pretty cool one to share. Most of the home owners in this neighborhood are around 20-35, so I’m not really surprised that they snuck a few video game references in there. Just for fun, what franchises would you name a street after? That’s it. I’m moving to Spain. I don’t get it. Name your streets something that makes sense so people who have to drive around all day (me) can figure out where they’re going. If you want to pay tribute to Mario, build him a statue ;).